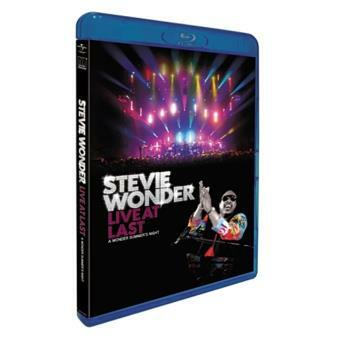 Aside from being his first BD release, Live At Last is Stevie Wonder’s first high definition release on Blu-Ray disc, providing unparalleled picture quality as well as pure and uncompressed 5.1 surround sound--the highest standard of sound quality ever achieved on a Stevie Wonder release. Filmed at the O2 Arena in London over two nights, September 30 and October 1, 2008, before a rapturous audience of 15,000 each night. The concerts were part of the first Stevie Wonder world tour in over a decade which sold 120,000 tickets in the UK alone. Live At Last’s set list traces a lifetime of innovation and accomplishment--and, in fact, our own lifetime appreciation of his music, stretching from Wonder’s teens with “My Cherie Amour” and “Signed, Sealed, Delivered I’m Yours.” Along the way, the show encompasses all the classic hits that redefined pop and R&B music, including “Superstition,” “Higher Ground,” “Living For the City”, “You Are the Sunshine of My Life” and “I Wish”, while reaching into his classic albums for such enduring fan favorites as “All I Do,” “Overjoyed” and “Knocks Me Off My Feet”. The exuberant “Don’t You Worry ‘Bout a Thing” is preceded by Wonder’s interpretation of Chick Corea’s instrumental “Spain”. And in a delightful, impressive and emotional moment, Wonder’s daughter Aisha Morris--the inspiration of his classic “Isn’t She Lovely”--steps from the background vocal group and performs Nat “King” Cole’s jazz standard “I’m Gonna Laugh You Right Out of My Life”. Wonder also takes time out in the set to salute the British audience with an affectionate medley of two Beatles songs (“Fool on the Hill”, “I Want To Hold Your Hand”) and a Rolling Stones classic (“[I Can’t Get No] Satisfaction”), book-ending them with the traditional “London Bridge is Falling Down”.